A Hawaiian Pizza-dilla is a fun twist on this popular flavor combination with barbecue sauce, pineapple, ham and cheese. There’s even a special name for pizza quesadillas! It’s the best of both worlds. It tastes like pizza, but cooks on the stove-top and is ready in under 30 minutes. It’s easy to fall into a rut and make plain cheese quesadillas over and over and over again. No more! When it’s fall try Butternut Squash and Spinach Quesadillas, And, when it’s pizza night make this recipe. Of course, this technique is perfect for many other topping combos. Pepperoni pizza lovers should check out Pepperoni Pizza Quesadillas. Make this recipe entirely on the stove-top. You’ll need a large skillet and an assembly line if you’re cooking for a crowd. Dice deli ham or leftover baked ham. Set out your favorite barbecue sauce. Dice fresh or canned pineapple. Thinly slice or dice red onion. Chop cilantro – This is optional…except at our house! Tortillas – keep a stash in the freezer and you’ll always be minutes away from a pizza-dilla. Mix together any extra ingredients and stir in lime juice to taste so there’s a salsa for the side. 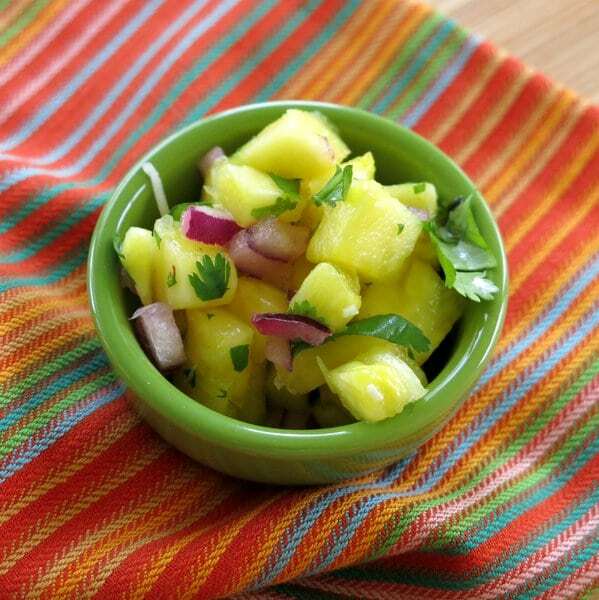 🙂 Add diced peppers and tomatoes to make Easy Pineapple Salsa! Coat the outside of the tortilla with olive oil (and a little butter, if desired.) Place it butter side down in a frying pan. Layer on the ingredients and top it off with another one. When the bottom starts to crisp and the cheese starts to melt, flip it over with a big spatula and then crisp the other side. Use a pizza cutter to easily cut the pizza quesadilla into triangles. Pizza night just got interesting! Please rate this recipe if you make it and tag @DinnerMom on social media. We love to see what you are cooking up! A Hawaiian Pizza-dilla is a twist on this pizza parlor favorite. This recipe uses ingredients often on hand so it's perfect for last minute dinners! Lay 4 flour tortillas on a flat surface and brush the side facing up with BBQ sauce. Layer ham, pineapple, red onion, cilantro and cheese on top of the 4 flour tortillas brushed with BBQ Sauce. Brush one side of each of the remaining flour tortillas with BBQ sauce and place one flour tortilla, BBQ sauce side down, on top of the flour tortillas layered with ingredients. Coat the bottom of a large frying pan with olive oil. Butter the outside of the tortillas, if desired, for a crispier quesadillas. Cook quesadillas in batches over medium heat, by placing each quesadilla in frying pan. When the bottom layer is toasty and the cheese has begun to melt (about 1-2 minutes), flip the tortilla over and toast the other side for a few minutes more. That is so much goodness packed into a tortilla! Hawaiian pizzas are my oldest’s favorite, I’m totally going to surprise him with one of these. What a great weeknight menu item! quesadillas are one of my favorite fall back recipes too. I’ve never thought to go the pineapple route! I live switching up flavors so we are on top of this next week! The only thing better than pizza is Hawaiian pizza quesadillas! These are so fun for summer! Savory and sweet, love it! I’m digging that salsa on the side too! My mother-in-law has been here for a while from Italy and we were just telling her about Hawaiian pizza and she was intrigued. I love this idea in a quesadilla…so much fun!! I love, love, love these Hawaiian pizza quesadillas. You are so creative to think of them! They’re brilliant! Mmm Quesadillas are big at our house too! Perfect for anynight! So perfect for summer! Without AC, I don’t like turning on the oven so these are perfect. What a great idea! My husband ALWAYS orders a Hawaiian pizza – he’d love these quesadillas! My husband loves Hawaiian style anything so he would be a big fan of this quesadilla. Love this sweet and savory combo. Quesadillas take on a variety of flavors so well! I can never turn down Hawaiian pizza, so this sounds irresistible. I love pineapple and I love quesadillas! Didn’t think to combine them like this! Sounds and looks absolutely yummy! Thanks for sharing! The Parmesan cheese on the tortilla sounds delicious! This was wonderful. My MIL couldn’t stop raving about it. I added a little cream cheese and cooked mine in a sandwich press so I didn’t have to flip it. Pinning it to make again for sure. I’m so glad you liked it! Fantastic tips!